This cake is rich, soft and moist with a meringue-like crust. It is moister the day after baking. Dissolve coffee in one teaspoon of hot water. 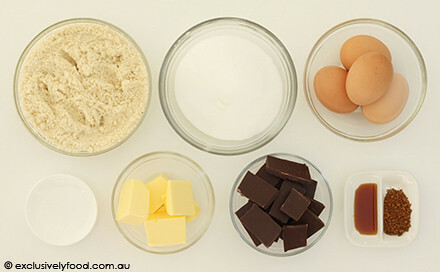 Place butter, chocolate, vanilla and dissolved coffee in a medium saucepan over low heat, stirring occasionally. Remove from heat when chocolate and butter have melted and mixture is smooth. Set aside to cool to room temperature. Using electric hand-held beaters or an electric mixer, beat egg whites with about half the sugar in a large, clean bowl. Beat until soft peak stage (when the beater is lifted, a peak will form and then droop over). In a separate bowl, beat yolks with remaining sugar using electric hand-held beaters or an electric mixer. Beat until mixture is light, thick and creamy. Gently fold cooled chocolate mixture into yolk mixture. Break up any lumps of almond meal before gently stirring it into the chocolate mixture. Spoon about one third of the egg whites into the chocolate mixture and use a spatula or large spoon to gently fold the egg whites through the mixture until just combined. 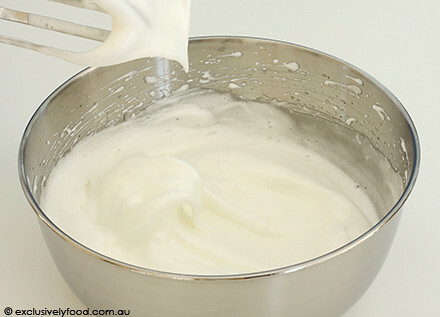 Fold in remaining egg whites until just combined. Pour mixture into prepared pan and bake for 40 minutes. Remove cake from oven and cover with a clean tea towel. Allow to cool in pan. Serve slices of the cake with whipped cream, berries, ice cream, chocolate sauce or simply dusted with icing sugar. Both children and adults love this recipe. It was an instant hit and so easy to make. An absolute Gem. This cake is to die for - absolutely delicious. It would probably be really nice with some nuts inside too. I made this cake last week for a friend who is gluten intolerant. It was a big hit! Very tasty & definitely agree that it is even yummier the next day. I've seen a few of your recipes with raspberry coulis. Do you have a recipe for that too? We don't currently have a recipe for raspberry coulis, but we found one here. do supermarkets sell almond meal or do we have to ground it up ourselves? Almond meal is available in the baking section of most supermarkets. If it is unavailable, you could pulverise blanched almonds in a food processor. Unfortunately, we have never seen or heard of the type of cake you've described. Could the crushed hazelnuts have been added after the cake was baked? Do you have a photo or website that we could refer to? The cake company doesn't have a website but I will try and get a photo of the cake to send to you in the next few weeks. I don't think the base was added after the cake was cooked, I think it's put in before the cake mix... Alesha. How many days ahead can this be made prior to serving? You could bake the cake up to three days in advance. if i was to halve this recipe... how long would i bake it for? Forty minutes baking time is sufficient in our oven. We like the cake to be quite moist, but you could extend the baking time a little if you prefer a slightly drier texture. We don't recommend baking the cake for more than one hour. Did the other recipe have the same pan size and baking temperature? oh my god this cake is sooooo amazing. i love making birthday cakes and i always make this one for people. - it always goes down a storm. even better you can eat it for days after and it just gets better! This cake was absolutely delicious. I have made another flourless chocolate cake which was a favourite in the past but it didnt rise and was sort of flat. Your cake rose up and is DEVINE!! is coffee granules the same as instant coffee? which coffee do u use for this recipe? Instant coffee granules or powder can be used in this cake (we have adjusted the ingredient list to reflect this). We use whichever brand we have on hand. Could I use hazelnut meal instead of almond meal? Hazelnut meal should work well as a substitute for the almond meal. To the person who asked about the baking time for half the amount of batter: If you use a loaf pan that is about 20cm long and 8cm wide (so that the cake is the same height as the one above), you will probably need to bake the cake for 30-35 minutes. Can I bake this in a 9 inch springform pan? If yes, do I need to shorten the cooking time? Will this recipe work if I use a 20cm round pan (not springform pan) and any idea on how to remove it after baking? Will the top meringue crust start cracking and breaking up upon removal? Thanks. Fabulous recipe! Easy and good for Easter. Thought it was going to flop in my awful oven, but it absolutely prevailed! Cake ho! Great Success. A big hit with all who tried it. At first seemed a bit fiddely, but well worth it. Was thinking of using a muffin tin to make individual cakes. Your thoughts? does this recipe translate well into cupcakes? i have tried some of your recipes and wow... thanks for sharing them with us! they're delish! Totally yummy! I recommend this cake - will make again for sure. Ikho, I made this into 12 cup cakes and cooked them at 150 degrees C in a fan forced oven for 20 - 25 mins. They were glorious. I used raspberry flavoured butter cream to ice them. I got so many complements. Thanks Amanda and Debbie. Love your recipes! You could bake the cake in a 9 inch diameter pan and reduce the baking time. We have only ever baked the cake in a springform pan, but we have seen other flourless chocolate cake recipes that don't specify a springform pan. The top crust sometimes cracks even before the cake is removed from the pan. I made this yesterday and it really tasted heaps better the next day, even after refrigeration. Just heat in the microwave for 10 secs and serve with icecream. Very delicious and rich. I would probably make a quick hot chocolate sauce to serve with it next time as I used high cocoa chocolate so it was not that sweet but very rich. Hi, if i want to make this and eat it the next day should i store it in the fridge or an airtight container... or both?? What a fantastic recipe! I used fine raw brown sugar instead of caster, and then added frozen berries before baking. It's delicious! I can see this becoming a favourite dessert at dinner parties. Thanks for publishing this. We store the cake in an airtight container at cool room temperature. In hot weather, we store the cake in the fridge. This was super delicious - the texture was incredible, especially the next day (next time, I'll use a finer almond meal though). I added 1 teaspoon ground chilli, 1/2 teaspoon cinnamon and 1/4 nutmeg for a Mexican inspired flavour. - I also replaced the coffee with approx 3 tsp of cocoa, to give it a little bit richer chocolate flavor. I saw on TV similar recipe and decided to make one. I did this recipe with some modifications such as 150 gr of butter, 130 gr of brown sugar as chocolate was too sweet. Also added about 150 ml of cherry port, frozen berries. I didn't have almond meal but LSA (healthy alternative). LSA is a mix of linseed, sunflower and almond meals. It is in oven, smells divine. Will write later whether it was successful or not. Ok. cake is ready. It is light, airy, enough moist, not super sweet. 5 stars. Will make chocolate frosting to top it. CAn I use milk cooking chocolate instead of dark one? Hello, I was wondering if the instant coffee is essential? Or if it can be replaced with something (like cocoa) or left out altogether? Alternatively can it be replaced with ground espresso coffee? Cut up and sitting on the wire rack, just waiting to be eaten. Looks exactly like the pictures, except in squares. And, it's incredibly delicious! I replaced the coffee with cocoa powder instead. Going to dust it with icing sugar and bring some to school for friends who are eagerly anticipating it :) Thank you for such a fantastic recipe! Wanted to try something new to take to a Wedding Shower next week, made this today to trial it. Didn't even wait for it to cool properly, so good. I let mine cool for longer and substituted the coffee for amaretto (two reasons: I hate coffee and my hubby loves almond!). I dusted with icing sugar and served the next day. My family and friends all hand second helpings - gone in one sitting! A first for cake! Making it again tomorrow for my family and one to take to the in-laws! My mum and I Made this tonight and after 50min fan force on 160 it was very gooey - almost undercooked is this normal? This recipe works well with sweetener instead of the sugar. I used Splenda and the result was excellent. I've made this cake a few times now, all with great success! A wonderful recipe to have in one's baking repertoire - many thanks. If I needed to make it 4 days before an event, would it freeze well or would it survive that long in a sealed container? Just made it! Perfect texture, moist inside with lovely flaky top. Covered it in sifted icing sugar and leftover chocolate which I grated. Simple, easy, delicious. Ive made this cake 4 times now - it is amazing! I use Lindt chocolate. I have also made it 3 days beforehand and just put it in a container - still amazing!